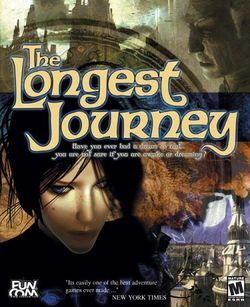 The Longest Journey is a point-and-click adventure game designed in Norway by Ragnar Tørnquist. It is the first game in an intended trilogy, and was followed in 2006 by Dreamfall: The Longest Journey. The third part has been announced as an episodic series entitled Dreamfall Chapters. Between Stark and Arcadia there is an ancient balance. For thousands of years this Balance has weighed the scales of the cosmos evenly, ensuring harmony between science, magic, order and chaos. But, now in an age of great turmoil, chaos threatens to tip the scales and bring terrifying dreams to life. As the tides of chaos gain momentum the fate of everything lies in the hands of one person. Her name is April Ryan. She is a Shifter. The power to walk between worlds is within her grasp and her destiny is foretold in a hundred tales. The journey ahead is treacherous, winding and shrouded in mystery, this is the longest journey of them all. As of May 2007, the game is available for purchase and download from Steam. This page was last edited on 30 May 2016, at 14:30.